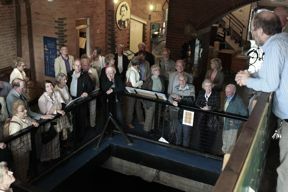 We offer public tunnel boat trips during the summer months, for which guides are required to explain the history of the tunnel and the canal to our visitors. We provide guided towpath walks, occasionally on a scheduled basis but mainly for pre-booked groups. we provide in-museum short talks for larger pre-booked groups and some groups require a more specialist talk. We provide guided towpath walks to groups who are visiting the museum. We are looking for more people who could undertake such guide work. A general knowledge of canals is needed, or a willingness to read up on the subject, as well as to learn the specific information that needs to be imparted to visitors. You need a confident personality, to enjoy working with people and to have the ability to put across historical information in an entertaining way. These events are a mix of entertainment and adult education and the guide has to balance those things. We can training if you have the ability to talk to a group of people. Leading a walk takes from 2 hours to 4 hours, depending on the audience and the destination. We don't expect you to always be available for every towpath walk or tunnel trip we offer but you will be someone the Volunteering and Training Manager can call upon from time to time. Groups of more than 20 people are offered an introductory talk when they arrive at the museum. This talk covers a brief history of the museum building, and something about the exhibitions and the history of London's canals. Normally this is not a detailed presentation but a simple introduction to the museum and its exhibits, after which the group visits at leisure and the guide is available for questions. The role may also involve making tea and coffee for a group after the talk. The tunnel boat trips operate on selected Sundays and, to be confirmed, on some Tuesdays from May to October. You would be expected to do up to four trips on any one day, but there is flexibility here and the work is shared between several people. Generally the same people do all of these similar, related tasks, i.e. group guides, towpath walking tour guide, and tunnel boat trip guide, as they all involve a similar set of skills. Groups come on all days of the week, (except Mondays when the museum is not open). The times of arrival for groups are very variable and they are nearly always during the daytime, as are all the towpath walking tours. A volunteer guide will usually be in for about two hours when a group is expected, to help set up the refreshments, ensure they are at the museum in time for the arrival of the group and clear up once the refreshments are finished. We don't expect you to always be available for every group, but to be a person our Volunteering and Training Manager can call upon from time to time to be a welcoming presence during the actual visit. If you can serve coffee and talk about history at the same time, you could be the person we want to talk to! A friendly person with customer relationship skills, especially with older visitors.